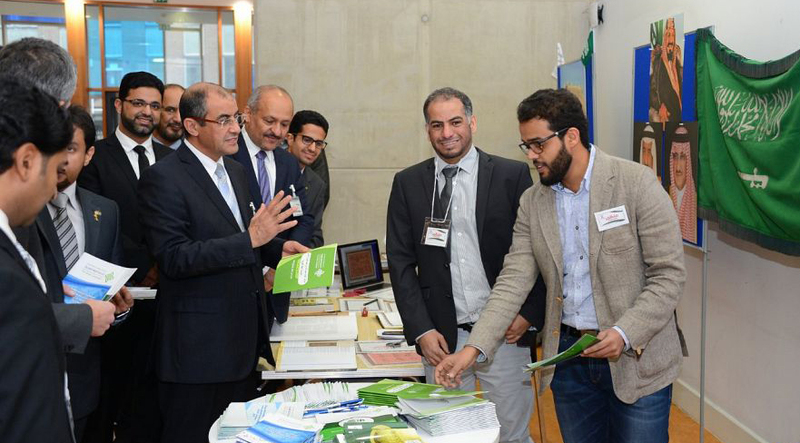 The Islamic Cultural Centre was delighted to participate in the World Arabic Language Celebrations of 2016 in The University of Reading Hosted by the Saudi Students Society of The University. The Event was an amalgamation of an Arab Themed Exhibition, Short talks and a Ceremony celebrating the UNESCO World Arabic Language Day. Participants included Dr. Fahad Alnoeim Acting Cultural Attache of the Royal Embassy of Saudi Arabia, different Arab student societies from Reading, Brighton, London and many Cities across England. The event was represented by Dr Ahmad Al Dubayan - Director General and Mohamed Omar of The Islamic Cultural Centre London. During the opening ceremony Dr Ahmad Al Dubayan gave a speech stressing the importance of Arabic language & learning, culture & literature and the bursting of its eloquence and rhetoric with its rich history and Heritage. Dr Al Dubayan also highlighted the enthusiasm of a lot of people to learn Arabic for cultural appreciation and desire to understand the Holy Quran. Dr. Al Dubayan also discussed the many challenges in learning Arabic, including the demand for qualified Arabic language teachers, the non-existence of a universal curriculum, and the lack of an environment to practise Arabic outside Arab Countries. Acting Saudi Cultural Attache Dr. Fahad Alnoiem in his speech highlighted to the audience the importance of the role the Arabic language has played throughout history and in different civilizations. Dr Alnoiem played tribute to the Saudi Students Society, its President Dr. Mohamed AlShamimri, the event organisers and all participates as todays celebration was a testament of the universal appreciation of Arabic Language.